Avatar Reality, developer of the massively multiplayer online virtual world platform Blue Mars, has raised an additional $4.2 million from Kolohala Ventures and co-founder and games industry veteran (and somewhat of a legend) Henk Rogers. That brings the total invested in the company to more than $13 million, according to the press release. In addition, Avatar Reality has announced that it has recruited Trent Ward to join as the new VP of Design. Ward has been in the industry for quite a while, having worked as creative director for companies like Foundation9, Ubisoft and Electronic Arts. 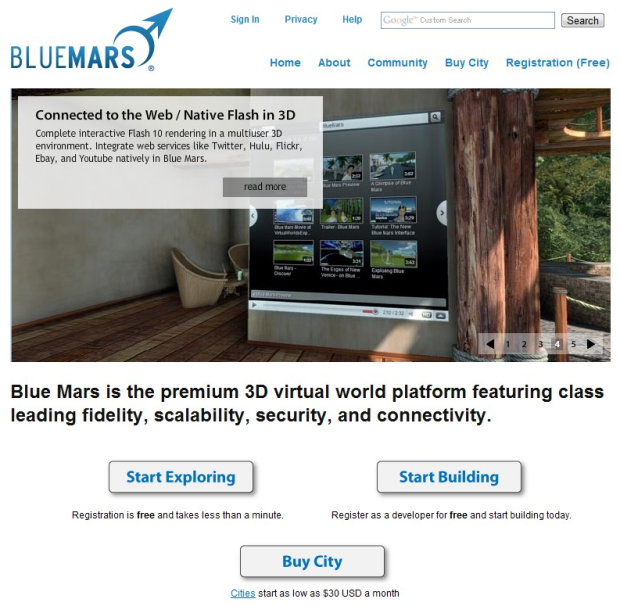 Blue Mars is a 3D massively multiplayer works where people can come to create virtual hangouts, games, applications, simulations, shops, businesses and entertainment venues. It launched in open beta in October 2009 and began selling virtual land to third-party developers in January this year. You can find more info about pricing here. Avatar Reality co-founder Henk Rogers is quoted as saying that Blue Mars is “the inevitable next step in immersive 3D virtual worlds”, which makes me immensely curious if only for the history of the man. I’ll let you read his Wikipedia profile for more information, but basically Rogers was singlehandedly responsible for bringing Tetris to the Western hemisphere in the early nineties. Avatar Reality, founded in 2006, is led by CEO Jim Sink, who previously managed business development and partner acquisition at Microsoft’s Xbox Live division. The company has more than 30 employees in Honolulu and San Francisco.